This may be Mitch Hedberg. 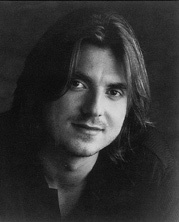 NEW YORK - Comedian Mitch Hedberg may have died of a heroin overdose. According to reliable sources such as cable television network Comedy Central, Hedberg might have passed away sometime recently. "Who?" asked Jeff Zucker, who may be the president of NBC Entertainment. Hedberg was allegedly referred to occasionally as the next Seinfeld. Despite his death, Hedberg may still be performing tonight in Baltimore. When asked about his death and the presumed cancellation of the performance, a spokesman from the venue said, "We will make an announcement later today." Calls to Hedberg's agent on Monday requesting booking information were rudely terminated by the agent, who said, "Call back next week." "It's a shame that Mitch died so close to April 1," said a representative from Comedy Central shortly after his obituary was pulled from their website. Mitch Hedberg declined Marco.org requests for comments on this story.